Frederic, Lord Leighton (1830–1896) was a bastion of the arts establishment in the UK in the late nineteenth century, being the President of the Royal Academy from 1878 to 1896. He trained under the Austrian history painter Eduard von Steinle, Giovanni (Nino) Costa, a Roman member of the Macchiaioli, at the Accademia di Belle Arti in Florence, and then lived in Paris from 1855-1859. Although Wikipedia claims that he won the coveted Prix de Rome, his name does not appear in the list of winners on Wikipedia, and elsewhere it is claimed that he won the award for sculpture rather than in painting, in 1889. However Wikipedia does not list him for sculpture either, although he was also an accomplished sculptor. With the popularity of Impressionism and Post-Impressionism at the end of the nineteenth and into the twentieth centuries, Leighton’s work was not just forgotten, but reviled for many decades. It is only in recent years that it has been re-evaluated and he is in the process of being ‘rehabilitated’. Whether or not you have a taste for his paintings, he was an extremely accomplished narrative painter, and his work merits examination in that context. It is often not appreciated that Leighton did not simply turn out fashionable eye-candy such as his still hugely popular Flaming June (1896), but tackled a wide variety of genres and subjects. He painted many superb and very painterly plein air oil sketches around Europe, some huge murals, and even made a set of book illustrations for George Eliot’s historical novel Romola, which was first published in a 14-part series in Cornhill Magazine during 1862-3. Frederic, Lord Leighton (1830–1896), “You didn’t think it was so pretty did you?”. illustration for Romola (1862), wood engraving by Joseph Swain, dimensions not known, first published in Cornhill Magazine, January 1863. Wikimedia Commons. Filippo Brunelleschi (1377-1446) was a central figure in the Southern Renaissance, an architect and civil engineer who is generally credited with developing the first geometrically correct perspective projection for use in 2D drawings and paintings. It was he who designed and supervised the construction of the brick dome of the Santa Maria del Fiore cathedral in Florence. He died there on 15 April 1446. Leighton follows convention in locating Brunelleschi’s death in a building in Florence, whose window opens to a view of the dome of the cathedral. Brunelleschi is shown half-recumbent in extremis in a chair, as if flattened onto a two dimensional plane. The complex array of buildings seen between the window and the dome appear to defy correct perspective projection, but have in fact been carefully projected, and contrast with the flatness of the dying man. Leighton, who painted this when he was in Italy, thus uses this simple story to discuss Brunelleschi’s perspective and its effects in painting in a visual manner. Shakespeare’s tragedy Romeo and Juliet (published 1597) explores the relationship between two lovers from families engaged in a long-standing feud, in Verona, Italy. After her secret marriage to Romeo, Juliet is promised in marriage to Count Paris, of the ruling house of Verona. The friar who performed their marriage offers her a potion which will put her into a deathlike coma for forty-two hours, which she takes in order to avoid her arranged marriage. The play reaches a climax when Juliet is then discovered apparently dead, and her body is placed in the family crypt. However a messenger intended to inform Romeo of Juliet’s plan fails to reach Romeo in time. Learning of Juliet’s apparent death from his servant, Romeo buys poison, and goes to the crypt in which Juliet is laid out. Meeting her fiancé, the two men fight, and Romeo kills her fiancé before taking poison himself. When Juliet awakens from her coma, she sees Romeo dead, and stabs herself with his dagger. Following this triple death, the Capulet and Montague families make peace and end their feud. Frederic, Lord Leighton (1830–1896), The Feigned Death of Juliet (1856-8), oil on canvas, 113.6 x 175.2 cm, Art Gallery of South Australia, Adelaide, Australia. Wikimedia Commons. Leighton shows Juliet apparently dead, laid out at home before she is moved to the crypt. She is surrounded by her immediate family, the Capulets, who are shown highlighted for emphasis. Lord and Lady Capulet are closest, with Juliet’s nurse behind. Count Paris is at the right, with Friar Laurence behind him. A queue of others leads into the background. The window reveals the two prominent towers of Verona, and at the back of the house preparations are still being made for Juliet’s wedding. Facial expressions are of grief and anguish, with body language in support. 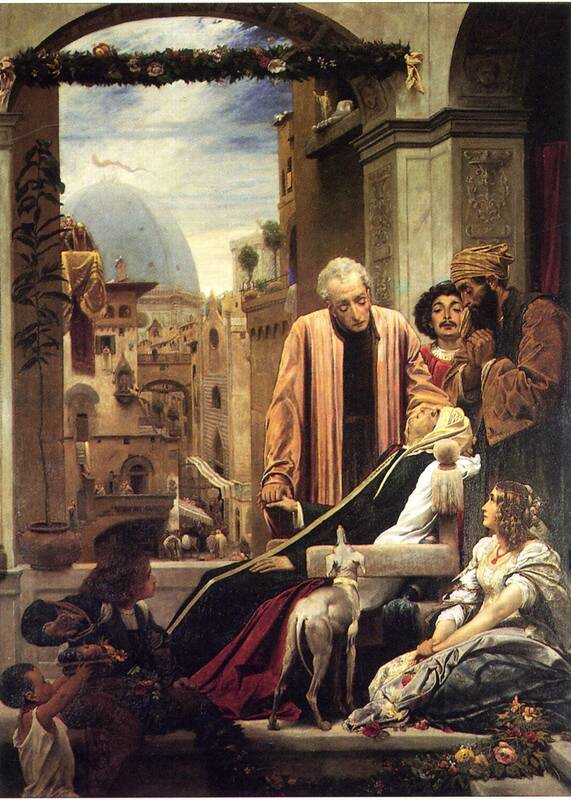 Leighton’s use of lighting for emphasis is reminiscent of its use in narrative by Rembrandt, and seems particularly appropriate for a painting of a play. He also painted a scene showing the resolution of the plot, in which the feuding families are reconciled. A woman is sat at the left, her hands outstretched to carry the little that remains of a skein of red wool. 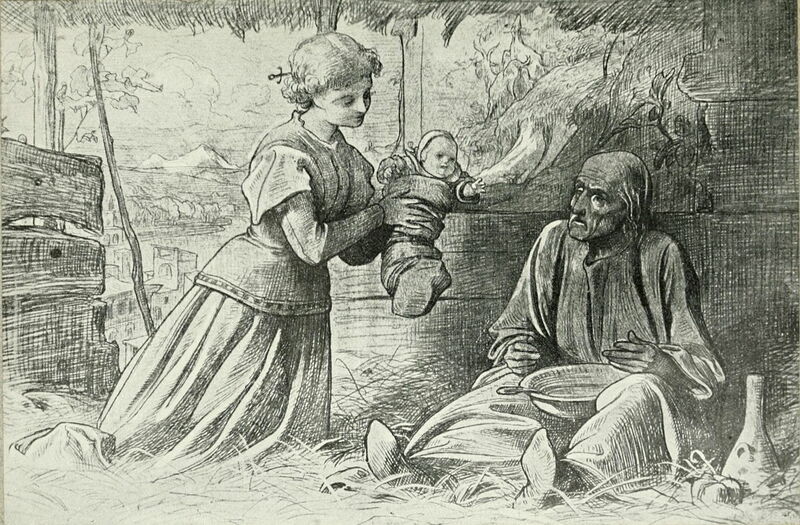 At the right is a young girl who is winding the wool from that skein into a ball. At her feet are four balls of wool which she has already wound. By the side of the woman, closer to the viewer, is a woven basket containing other skeins of wool in various colours. This takes place on the roof terrace of a house, behind which are distant bays and rocky scenery of the Bay of Lindos on the island of Rhodes, Greece. No external narrative appears to be referenced by this painting, and it is easily read as just a pleasant view, a superficial confection. However, it contrasts its timeless air with an activity which is often used to fill in time with a purposeful but repetitive task. I think that Leighton also saw these references to the immediate passage of ‘momentary’ time against the much bigger scheme of ‘deep’ time, and how the days in our short lives measure up against the much slower progress of centuries and civilisations. In Greek myth, Electra was the daughter of King Agamemnon and Queen Clytemnestra. When her father was murdered by her mother and stepfather, on his return from the Trojan War, she and her brother Orestes plotted revenge against them. This plot originated when Orestes and Electra met at their father’s tomb, and was inspired by Electra’s face there. The story is told in detail in plays by Sophocles and Euripides, and she appears in many other plays. Leighton shows Electra in funereal black, beside what appears to be a substantial mausoleum. She is in profound grief, her brows knitted, her eyes closed, their lids puffy from tears. Her arms are thrust up behind her head, where her hands are pressed against the top of her head, in a ritual gesture as if tearing her hair. This is a classical approach using Alberti’s ‘laws’. Despite the angle of her face, its expression is unmistakeable, and her body language also very clear. This painting is unusual for not showing Orestes, and it may have been Leighton’s intent to put the viewer in his place. The tale of Cymon, a young nobleman, and Iphigenia, a beautiful young woman, is one of the hundred novellas bundled into Giovanni Boccaccio’s The Decameron (1348-1353). Cymon had been an arrogant lout before he set eyes on Iphigenia. It is dusk on a warm May day, and she is sleeping in the woods with her servants and a dog. Cymon becomes a reformed character as a result, transforming into a perfect polymath. Leighton shows Iphigenia, stretched out languidly in her sleep, in the last warm light of the day; behind her the full moon is just starting to rise. He has changed the season, though, for autumn, with the leaves already brown but the days still hot. Cymon stands in shadow on the right, idly scratching his left knee, gazing intently at Iphigenia. Without knowing the original story, this is hard to read because so many of its cues and clues are non-specific. Apart from the change in season – which makes pictorial sense given the warm light of dusk – Leighton appears faithful to the original. Andromache is also drawn from Greek myth, in particular the Iliad, and two plays (Andromache and The Trojan Women) by Euripides. She was born and raised in Cilician Thebe, where her father was ruler. She married Hector, the Trojan prince who was the greatest fighter for the city-state of Troy during the Trojan War, at which time they had an infant son. When Hector was killed by Greek Achilles and the city of Troy fell, she was taken into captivity as a concubine by Neoptolemus, who had killed her son. She eventually went to live with Pergamus in Pergamum, where she died in old age. Andromache is shown, in black mourning clothes, in the centre of Leighton’s painting. She is queueing with many other women, presumably who were captured from Troy, to fill her vase with water from a well, shown at the right. Although others have children and appear to be clustered into groups, Andromache is stood in isolation, her head bowed in silent thought. There are references to Nicolas Poussin’s famous depiction of women with vases at a well in his Eliezer and Rebecca, but here in very different circumstances. His composition, particularly the use of a nearby family group, use of body language and clothing, are very effective at making Andromache appear completely isolated despite her physical proximity to others. This Greek myth tells of Andromeda, who was the beautiful daughter of the King and Queen of the North African kingdom of Aethiopia. Her mother, Cassiopeia, was so proud that she boasted that Andromeda was more beautiful than even the Nereids, who often accompanied Poseidon, the god of the sea. The latter decided to punish Cassiopeia for this arrogance, and sent Cetus, a sea monster, to ravage the coast of North Africa including Aethiopia. The king was told by an oracle that the only way to be rid of Cetus was to sacrifice Andromeda to it. She was therefore stripped and chained to a rock on the coast, abandoned for Cetus to devour her. Perseus was just returning from killing the Gorgon Medusa when he chanced upon Andromeda in chains. Wearing Hades’ helm of darkness to render him invisible, Perseus killed Cetus, set Andromeda free, and married her. Various geographers of the day, including Strabo, considered that Andromeda had been chained up at Jaffa, modern Tel Aviv. Leighton’s earlier painting shows the ‘invisible’ Perseus astride Pegasus, the winged stallion, shooting arrows into Cetus, while the monster surrounds Andromeda. Cetus is shown as a fairly conventional fire-breathing dragon, complete with stereotypical wings and a long tail. Andromeda is not naked, but some modesty is preserved by draping a white robe around her waist. Similarities with the story of Roger rescuing Angelica as shown by Ingres and in Böcklin’s Roger Freeing Angelica (1873, 1879-80) are clear. 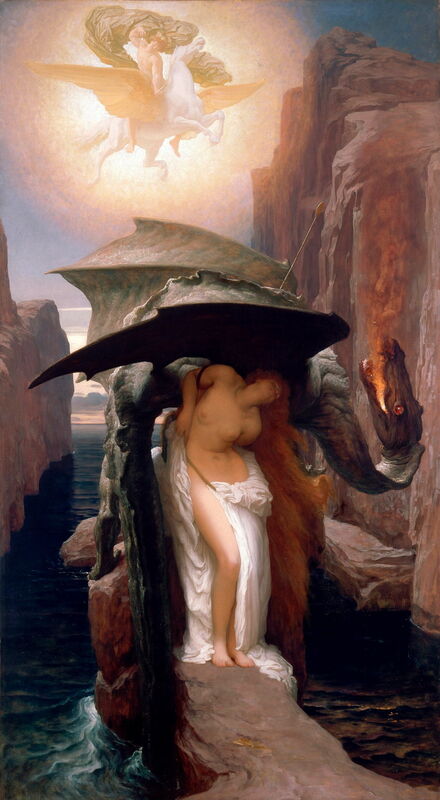 Leighton’s Andromeda is too contorted to allow us to see her facial expression, which in view of Cetus’ position is unnecessary for a reading. That contortion does convey the clear message that she is affixed to the rock. 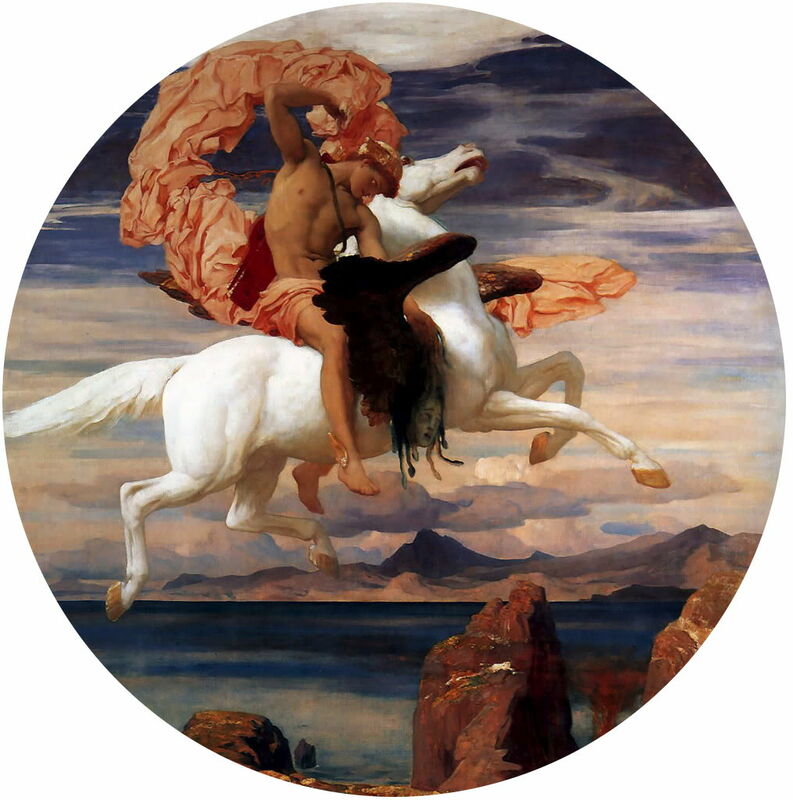 A few years later, Leighton made a separate painting of Perseus riding Pegasus, still holding the head of Medusa, which is remarkably similar to the inset image in Perseus and Andromeda. Considered to be one of Leighton’s most dramatic paintings, it was first intended to decorate Saint Paul’s Cathedral, London, but was rejected as being unsuitable. It was commissioned at reduced size by Henry Tate for his new gallery of British art, now The Tate Gallery in London. Unlike much of the fearsome imagery of the Second Coming described in the book of Revelation, this is essentially an optimistic scene, being the resurrection and spiritual salvation of those who have died at sea – an all too common fate around the British coast. A central family group shows stages of awakening: the man has been fully awakened, his son is just starting to breathe but still white, and his wife still bears the pale green hue of the dead. Around them, others are likewise being awoken from their coffins, presumably from burial at sea, or from the water itself. 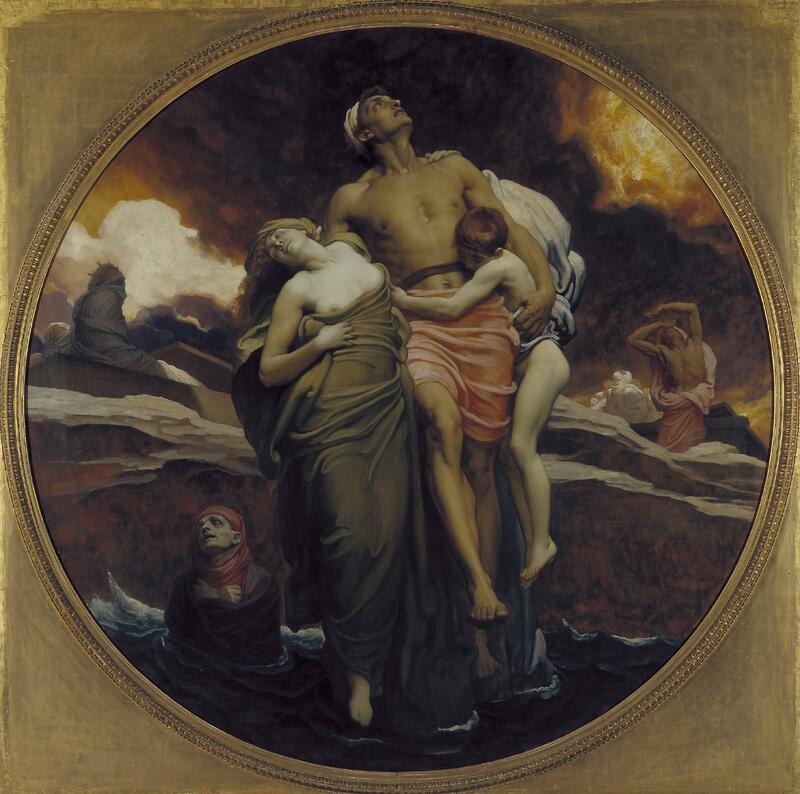 Leighton’s tones and colours probably refer to Géricault’s The Raft of the Medusa (1819), by far the most famous painting of shipwreck and death at sea, which Leighton would have been very familiar with. There are also references to Michelangelo’s Entombment (1500-1), which was in the National Gallery and a favourite of Leighton’s at the time. 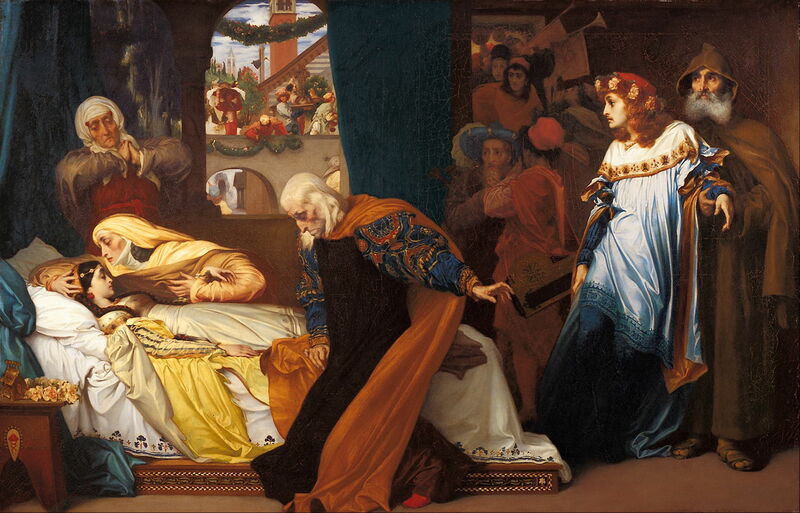 By and large, Leighton is eloquent in telling stories in these paintings. With his extensive classical training, he uses the basic tools laid down by Alberti very effectively, and augments them with the skillful use of light, perhaps developed from Rembrandt, adept composition, and many other cues and clues. 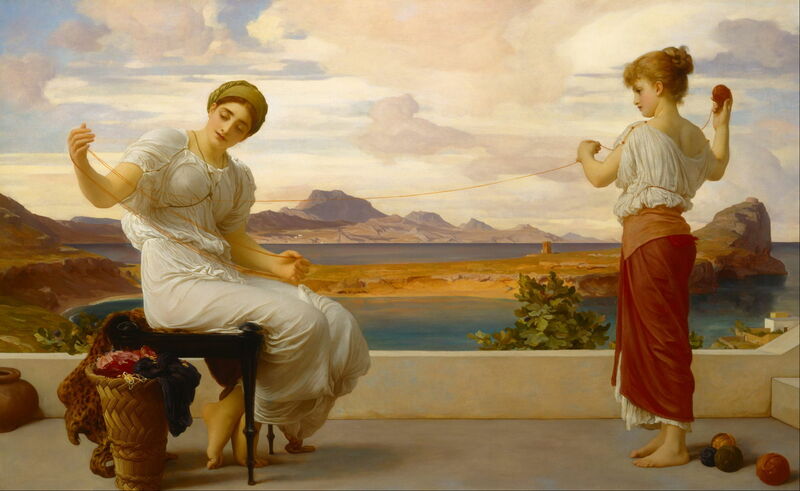 Other more static paintings by Leighton may well have deeper and narrative readings. I will return to the topic of time in narrative painting in a future article. Leighton also researched his paintings exceptionally thoroughly. He was involved in the British Museum and frequently accessed its library and collections to provide material for narrative paintings. Although, as Barringer & Prettejohn point out, some of the concepts and decisions made may today appear inappropriate or anachronistic, this is more likely to be the result of changing knowledge rather than carelessness on Leighton’s part. It is hard to see why his paintings are not more widely enjoyed today. Many of them tell engaging and topical stories exceedingly well. Barringer T & Prettejohn E eds (1999) Frederic Leighton: Antiquity, Renaissance, Modernity, Yale UP. ISBN 978 0 300 07937 1. Posted in General, Painting and tagged Boccaccio, Brunelleschi, Decameron, Eliot, Géricault, Leighton, narrative, painting, Romola. Bookmark the permalink.